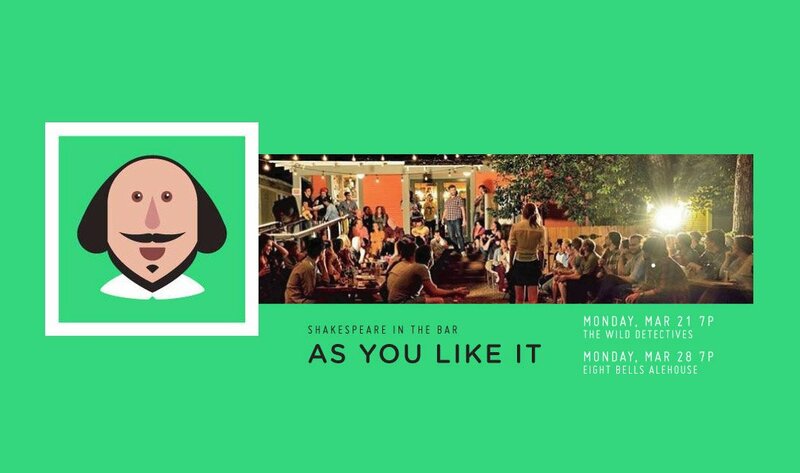 *Trumpet Flourish* Shakespeare in the Bar is coming at you this spring with a delightfully underrehearsed comedy about the nature of love, a cross-dressing heroine, and exiled royals living it up in the forest. Tickets will be made available through eventbrite on FRIDAY, MARCH 4TH AT NOON. Watch this event and like Shakespeare in the Bar to get the links for both shows at that time- set your alarms! Tickets are general admission and $7 each (plus processing fees)- proceeds go toward production costs and a charity of the cast’s choosing (to be announced)! Not able to grab tickets online? There is still hope! 50 tickets will be made available day-of-show, starting at 5pm on a first-come, first- served basis. Come on down! We will also be raffling off 26 free tickets per show- to be entered in the raffle, email shakespeareinthebar@gmail.com with your name and which date you would like to attend, for the chance to win 2 tickets!